This is my son, Ashok, during one our trips to our hometown in Goa, India. made a donation in my name to the National Breast Cancer Organization. And he signed us both up for the 5K walk in Chicago. I was proud to participate in such a worthy cause. And I was proud of my son for his generosity and values. win this wonderful quilt, the product of many loving hands, both in India and the U.S. And through your purchase, you and your mother will be part of a wider movement that is changing the lives of women, children and communities halfway around the world. This Mother’s Day, you can celebrate mothers from around the world. And you won’t have to get up at 5 a.m.
consider giving your mother something from our collection of clothing, accessories and home interiors. Visit us at www.marketplaceindia.com. 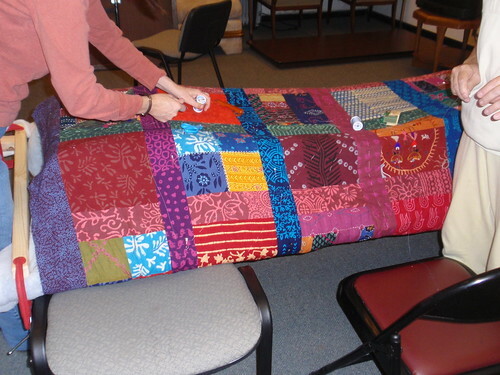 The quilt spans the ocean: it was made by many hands, both in India and here in America. Purchase a raffle ticket to give your mother a chance to win and the opportunity to be part of a larger movement empowering women around the world. Wowzers! Ashok is all grown up into a beautiful young man! Great photo of the two of you. The quilt looks wonderful!